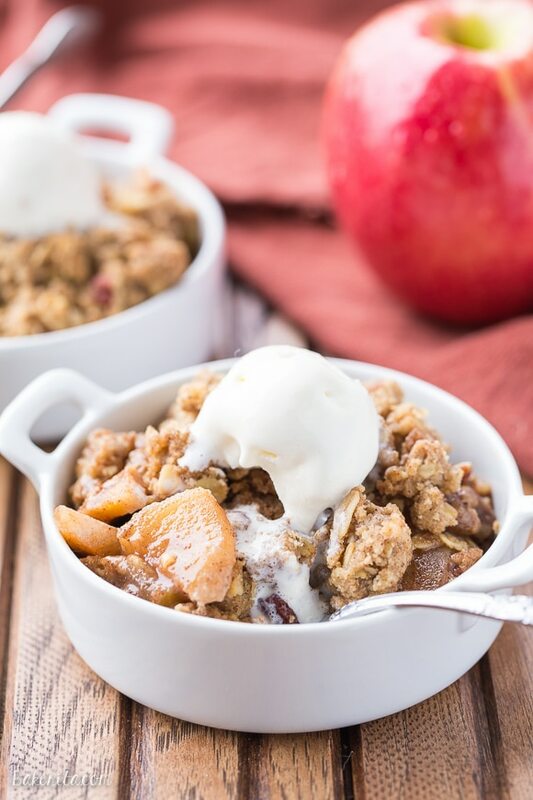 This Oatmeal Cookie Apple Crisp has a simple spiced apple filling, topped with a super easy oatmeal cookie crumble topping! Serve it warm with vanilla ice cream for an outstanding quick dessert. 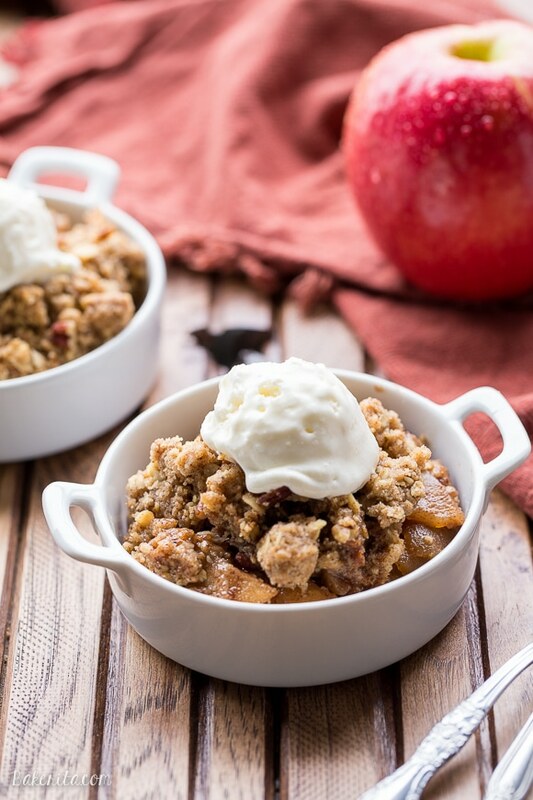 Let’s talk about one of my favorite things in the world: apple crisp. When people ask me what my favorite dessert is (which is a *serious* question, considering my life essentially revolves around dessert), apple crisp with vanilla ice cream is almost always my answer. Unless I’m in a major chocolate mood, I’m going with the apple crisp. 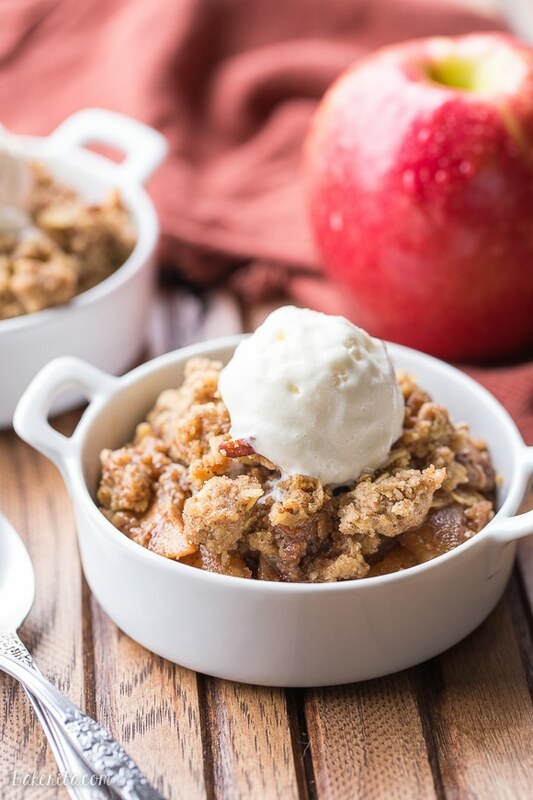 It’s so simple, and when the apples paired with just the right amount of sweetener and spices, their texture and natural sweetness really shine. I like to use a combination of apple varieties so I get a few different flavors and textures from the apples. Certain varieties, like Granny Smith apples, are very tart and firm, and they are a favorite of baker’s everywhere because of how well they hold up well in pies, tarts, and crisps. Other, less firm varieties, like Red Delicious or Mcintosh, break down a lot more during the cooking process. By using a combination of both, you get some firmer apple pieces that have retained their shape rather well, surrounded by flavorful broken down apples, which creates a rich sauce. For this recipe, I kept the filling super simple: apples, only a little bit of brown sugar, cinnamon, and nutmeg. That’s all. No need to overcomplicate things – simple is best here! Thankfully, the topping is JUST as easy as the filling…and don’t we all really eat crisps and crumbles for that delicious, buttery topping?! Since I love making my usual apple crisp with an oatmeal topping, I figured making an oatmeal cookie crumble would be even more delicious. With just three ingredients, it couldn’t be easier! The topping starts with a Brown Sugar Oatmeal Cookie Mix from Krusteaz, and instead of preparing the cookie mix as usual, you just add one stick of butter (skipping the egg the mix calls for) and mix it in to create oatmeal cookie crumbles! I opted to add toasted pecans as well, because I love the additional nuttiness and crunch they add to a crisp topping. You could substitute in your nut of choice, or just leave them off if you’re anti-nuts in your desserts. I baked the crisp in a small baking dish and then served it in little ramekins, but if you want to make individual crisps, you can bake them in the little ramekins from the start! Just make sure you top off each serving with a scoop of vanilla ice cream before serving ;) enjoy! 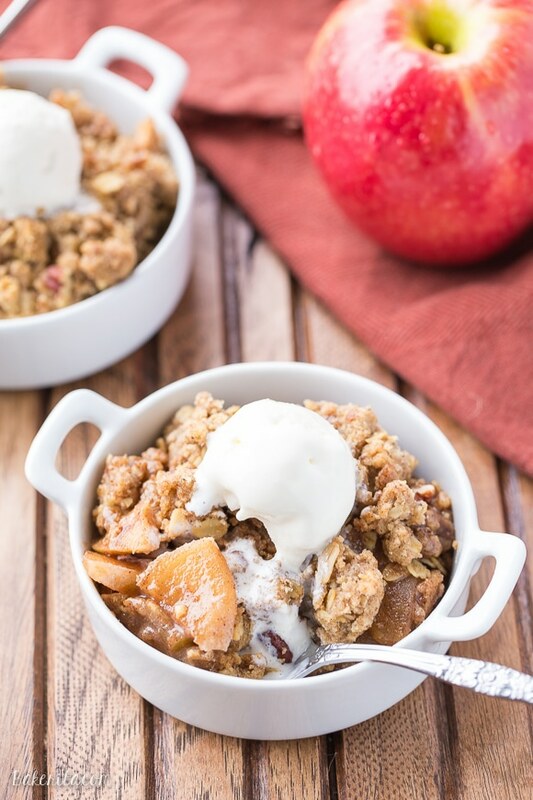 Get the full instructions for this Oatmeal Cookie Apple Crisp on Krusteaz.com. I agree with you, apple crisp is a favorite of mine, too! You just can’t go wrong with a classic dessert, especially when it’s warm from the oven with a big ‘ole scoop of ice cream. I’m loving the oatmeal cookie topping, Rachel! I just want to dive right in. Heading over to check out the recipe! Fruit crisps in general (with ice cream of course) are probably my favorite dessert! They are just so darn good! This apple one sounds delicious! Me too – thanks so much, Ashley!! What an awesome idea to use the Krusteaz cookie mix for the topping! I would have never thought of that. So easy and it looks so delicious Rachel! I can see why it’s a favorite! Thanks so much, Mary Ann!! 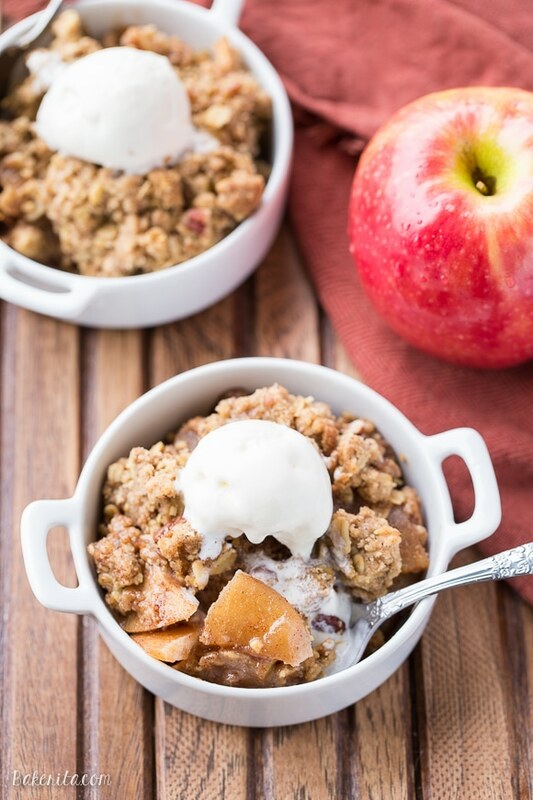 Apple crisp is my favorite dessert too! Actually anything with a crisp is a fav of mine. I just love the crunch and the cinnamon flavors. Yum! This recipe looks so good. I know it would be a hit in my house. Isn’t crisp the best?! Thanks so much, Cyndi! Oatmeal apple crisp ohhhh and with pecans! #BestideaEver, because its nostalgic for me, I remember Grandma’s big porch in Missouri, with family and friends and her Oatmeal applecrisp and home made ice cream….now that was The treat! And sneeking seconds if there was any left! Yes, yes, YES. Apple crisp is pretty much the best thing in the world! That oatmeal cookie topping looks extra thick and crispy, just the way I like it! Extra thick crumble is the only way to do it! Thanks, Ashley! I hear you on the apple crisp love! So, so good and vanilla ice cream + lots of crumble are musts! What a great idea to make an oatmeal cookie crumble. Such an easy way to get all of that great flavor and texture. Will definitely be trying on my next crisp, thanks! The recipe leaves out the amount of maple syrup. I used a third of a cup. Also used ready made dry oatmeal cookies about a cup. Came out fantastic. Thank you for the recipe.